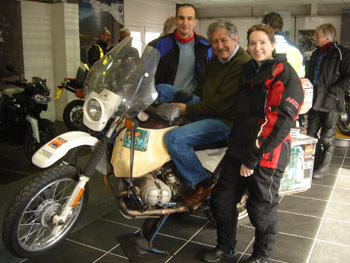 Yesterday, 9th March, we went along to London’s Ace Cafe for a talk by Ted Simon, seasoned round-the-world traveller and famous author of Jupiter’s Travels, the epic story of his journey 25 years ago and inspiration for many a two-wheeling adventurer. He was there to promote the launch of his latest book, Dreaming of Jupiter, which retraces the steps he took all those years ago and gives some enlightened insights into how the world has changed in that time. This was a pretty novel (no pun intended!) experience for us. We’d never previously been to London’s biker’s mecca, nor is it our habit to go to book signings to meet celebrities. It was great. We got to meet the man who’s gone round the world twice on a motorbike and have him sign a few copies of his book for us. When we discovered that Ewan McGregor was there too (Ewan’s a self-confessed Ted fanatic) we took the opportunity to get his signature too, and have a quick chat about his own plans for a trans-Africa trip with friend, Charley Boorman. Now, you might be tempted to accuse us of celebrity-mania, but because we didn’t actually manage to speak much to Ted at the Ace Cafe, we took the opportunity of travelling down to Dorset where we knew he was doing another book signing. This, it turned out, was an excellent idea. We not only managed to have more of a chinwag with the man himself, but he kindly obliged to have his photo taken with us too! In so doing, he showed is classic, calm approach to things. His bike, which was on display at the venue, had a ‘do not touch’ sign on it. When we asked about a pic, he asked the organiser in his most disarming and gentle voice ‘why can’t I touch my bike?’, then moved the sign and hopped on! We were chuffed. Now we had a couple of signed copies of his book and a pic together with the man who’s inspired so many intrepid biking travellers. After attending a friend’s wedding in June, 2006, Glyn borrows a friend’s F650 Funduro and goes for a test ride on a coffee plantation in Tanzania. The verdict? A large grin! He’s inspired and reassured. Trying out a two wheels “in the field” allows us to see and feel how bikes will handle on dirt tracks. Decision made! OK, so we’ve decided that we’re going to do a trans-Africa trip, and have spent the last few months figuring out how and where to go. But, I hear you ask, what is the inspiration behind all this? Well, it all started about 15 years ago, with a telephone conversation about how ‘cool’ it would be to travel the length and breadth of Africa. Cathy: It was at the very start of our relationship that we began thinking about just such an adventure, although it’s really only recently that the dream’s become possible. I was bitten by the travel bug very early in life, on family holidays to fabulous destinations throughout southern Africa. I became completely besotted with the ‘idea’ of Africa, developing something of a fascination with the romantic images conjured up by films like Out of Africa and Born Free. And despite experiencing the harsh realities of living in Africa firsthand, I reckon I still am! Glyn: Our first discussions were about whether it would be possible to do it on horseback. We both knew of people who’d done Cape Town to Cairo in various ways – walking, bicycles, a bike with sidecar. So in our daydreaming we considered a whole range of transport options. places to eat ask anything Over time, however, we sobered up and a few years ago we realised that motorbikes were our best bet. Everyone should have a big adventure at least once in their lives!